M-220 was a general purpose computer. The development team chief: Veniamin Stepanovich Antonov. The development team: A. A. Shul'gin, G. G. Zotkin, N. Egorycheva, V. S. Klepinin, V. Gurov. Development organization: the Scientific Research Institute of Electronic Machines (NIIEM). Manufacturers: the Moscow Plant of Calculating and Analyzing Machines (SAM), the Kazan Plant of Computing Machines (under the Ministry of Radio Industry of the USSR). The development was completed in 1968. Commercial production began in 1968. Applications: scientific and engineering calculations in various industrial enterprises and organizations as well as the Ministry of Defense organizations. About 200 computers were manufactured during the production period, including its upgrades М-220М and М-222 developed by the Kazan plant design bureau. The system architecture of the М-220 computer (as well as of the BESM-3 and BESM-4 computers) had little differences from that of M-20. The internal information links used in these computers were similar. Thus a large number of software packages developed for many years by the Russia leading programmer teams for М-20, were ported to M-220. Unlike М-20, all other computers of this group were based on semiconductors (potential-impulse circuits and diode-transformer logic). Another important fact was the ferromagnetic memory size which raised up to 16К words (for М-220) and up to 32К words (for М-222). The M-220 instruction set was also enhanced: several commands of switching from one memory unit to another were added. The instruction of multiplying a factor by 2 bits was implemented as well as instruction for square root extraction. BESM-4 and М-222 had interrupt system, memory protection and could communicate with other computers. All computers of this group got external storage and input/output devices upgrade. Components: the diode-transformer circuits based on P-401 transistors. Construction: М-220 and М-222 were constructed as a set of boxes with a single line of slots. Their electronics components were placed on the printed circuit boards (200х120 mm). Technology: for the first time in the history of the Soviet computer engineering, the complementary panels were wired by wrapping around plug pins. 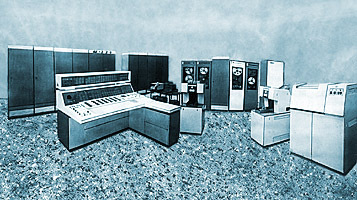 Software: the software of the М-20, М-220 and М-222 computer family was being created for more than 10 years by numerous research and educational institutes where these computers were widely used. The collection of software was large enough but irregular and poorly documented. There was a M-20 software distributor called the Association of M-20 Users. Additionally to the standard programs library there were an ALGOL-60 compiler, an optimized ALPHA translator (by A.P. Ershov), a FORTRAN compiler, and OS4-220 and OS DM-222 operating systems for М-220 and М-222 respectively. These operating systems provided a batch-processing mode and simultaneous execution of computations and input/output operations. The latter version of OS also provided a multitasking mode. Characteristics: М-220 and М-222 computers occupied at least 100 sq. m. each, depending on what optional peripheral equipment was used. Its performance was about 28 thousand instructions per second. Power consumption didn't exceed 20kW with 380/220V power supplies. Average failure-free time was 500 hours. Main features: an interesting approach to the M-220/222 logical architecture upgrade was taken in order to provide M-20 compatibility. For the first time wire-wrapping method was used in these computers, after 1970 it became the main method in computer assembly.